National Weather Service hidden message: Alaska forecast spells "please pay us"
Did the National Weather Service Sneak a Hidden Message Into This Forecast? With multiple extreme-weather events bearing down on the United States this weekend, key National Weather Service employees are working hard to track the storms and keep the public safe. But thanks to the government shutdown, they’re not getting paid for it. They’re not complaining, exactly. But the forecast analysis below, which appears to have been published by the weather service’s Anchorage office Friday morning, suggests they’re not entirely thrilled with the situation, either. 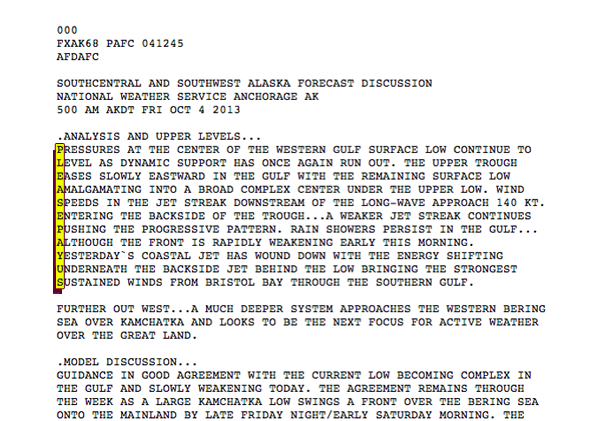 The Anchorage office of the NWS has a little something it would like to say to Congress. You can find the forecast online here. It’s hard to know for sure that it’s authentic—as the Washington Post’s Capital Weather Gang points out, there’s also a different version of the post going around that does not contain the acrostic. Regardless, it’s a pretty clever way to remind the country that a lot of government employees are still working on our behalf even without the assurance of a paycheck.